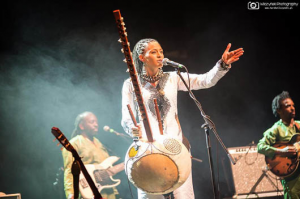 Kora virtuoso Sona Jobarteh is a modern-day pioneer in a musical tradition that has been handed down exclusively from father to son for the past seven centuries. Sona uses her innovative stance to talk about cultural identity, gender, love and respect while still rooting herself firmly in her traditional cultural heritage. Sona is reputed for her skill as an instrumentalist, her distinctive voice, infectious melodies and her grace onstage.